Here are genuine artists’ quality pastels — the softest in the world — uniquely packaged in stacking and interlocking jars. The packaging protects the colors, thus reducing damage and waste. 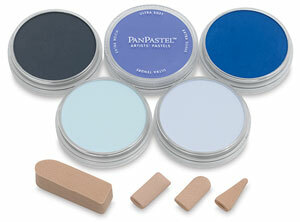 PanPastels were specially developed so that artists could lift, apply, and control pastel color, just like true painting. The pan format holds color like paint for easy application. Each pan contains 35% more material than the average pastel stick. (On average, based on a market survey of standard soft pastel sticks.) The label, with color name and number, remains with the color pan for easy identification. With PanPastel, it is possible to create more painterly effects. The artist can apply controlled marks, from intense to delicate — ultra thin “glazing” layers and veils of color. It is possible to block in large areas of color in seconds, for backgrounds, underpainting, and tinting paper. PanPastels clean up easily. Included with each PanPastel multi-color Sets of 3 are one Sofft mini applicator, two Sofft Covers, one Sofft Art Sponge, and a storage jar for these tools. Sets of 5 include one Sofft Art Sponge, two Sofft Covers, one Sofft Mini Applicator, and a storage jar for these tools. Sets of 6 or 7 include one Sofft Painting Knife, two Sofft Knife Covers, one Sofft Sponge Bar, one Sofft Angle Slice Sponge, and a palette tray with cover. Sets of 10 include two Sofft Art Sponges, four Sofft Covers, two Sofft Mini Applicators, and two storage jars to hold these tools. Sets of 20 include three Sofft Art Sponges, 10 Sofft Covers, three Sofft Mini Applicators, two Sofft Knives, and four storage jars. The set of 80 includes 80 PanPastel colors and a 44-piece Art Sponge combo pack, which contains four Sofft Painting Knives, 16 Sofft Knife Covers (including four each Round, Flat, Oval, and Point), one Sofft Applicator with four replacement heads, 12 Sofft Mini Applicators, and seven Sofft Art Sponges (including one each Wedge Bar, Point Bar, Round Bar, Flat Bar, Round Angle Slice, Flat Angle Slice, and Big Oval). The sets contain individual 9 ml (0.3 oz) jars of each color, plus a usage guide. Mediums, Set of 5 — These are true pastel mediums for creating pearl (fine) and sparkly (coarse) effects in your pastel paintings. Use PanPastel White Mediums to create tints, and Black Mediums to create darks and shades for rich, jewel-like effects. The Colorless Blender can be mixed with PanPastel color to create a variety of transparent effects. It's also great for softening and blending edges. The set includes one of each of the Mediums along with applicators. Metallic and Pearl Colors, Set of 17 — A great add-on for the 80-color PanPastel set — or a set for those who enjoy the "funkier" colors and mediums, this 17-item set includes all of the pearls, metallics, and mediums PanPastel offers. Also included are five Sofft knife covers and a palette tray with lid that holds 20 pans of color. Lia Griffith Designer Kit — Apply and blend this perfect palette of colors to add depth and detail to paper flowers and other papercrafts. 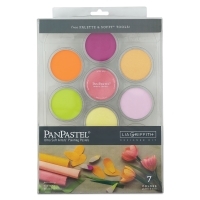 Inspired by DIY designer Lia Griffith, this set of seven PanPastel Artists' Painting Pastels includes one each of Bright Yellow Green, Light Gold, Magenta, Magenta Tint, Orange, Pearlescent Red, and Pearlescent Yellow, plus a Palette Tray and Cover (10-color format), and three Sofft sponge bars (Round, Point, and Wedge). 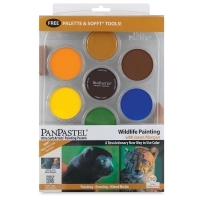 Wildlife Painting with Jason Morgan, Set of 10 — Inspired by UK-based wildlife artist Jason Morgan, this set includes 10 PanPastel colors (Black, Burnt Sienna Extra Dark, Burnt Sienna Shade, Chromium Oxide Green, Diarylide Yellow, Neutral Gray Extra Dark 2, Orange Shade, Orange, Titanium White, and Ultramarine Blue), plus a palette tray and six Sofft tools (a No. 3 Oval Painting Knife, two No. 3 Oval Covers, a double-ended Sponge Bar, a Point Sponge Bar, and a Round Angle Slice). PanPastels were created to offer the artist a new tool for artistic expression by merging dry medium with wet, painterly technique. 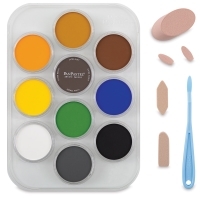 These highest quality pastels are rich, soft and lightfast and are contained in a truly unique pan that holds 35% more material than the average stick pastel. See what distinquishes these high quality artists' pastels and tools from any other. Both products were invented for artists by artists and offer a new and unique way of painting with pastel. This video will show various applications, tips, and techniques. 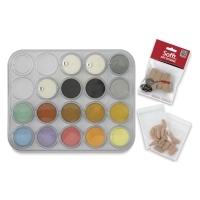 Sofft tools were specifically developed for use with PanPastel soft pastels but are so versatile, inexpensive, and reusable, they can also be used with most water-based art and craft materials. Try using with watercolor, acrylic paint, glazes and with a variety of dry mediums, such as hard or soft traditional pastels and charcoal to create exciting new techniques, marks, and effects.